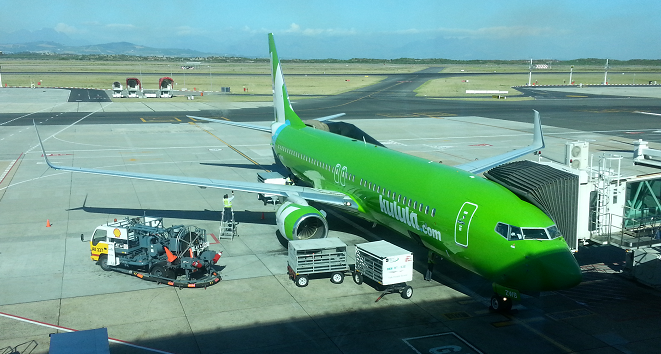 Kulula Cape Town to Johannesburg flight bookings quality fot earn SouthAfrica.TO discount vouchers. Email us a writeup of your flight, and we'll send you a travel vouchers (longer higher quality writeups earn more vouchers). Ask for a Flight Quote - we're itching to show you the best flight deal. CPT to JHB is Kulula's main flight route, and there are multiple daily Kulula flights from Cape Town to Johannesburg's OR Tambo International Airport as well as to Lanseria International Airport (CPT-HLA). If you're in a hurry, their Cape Town to to Lanseria flights are 5 minutes faster than from CPT to OR Tambo International Airport. Flights to OR Tambo take you to the east of the city, which is convenient for trips to the old city centre or to Soweto. Flights to Lanseria Airport take you to the north of the city, which a lot of businessmen like as the offer easy access to the Sandton business district, as well as to Pretoria. For onward connections to other cities, OR Tambo is a far better option than Lanseria Airport, with links to both all the cities in South Africa as well as many worldwide destinations. Almost all scheduled international flights are from OR Tambo International Airport. 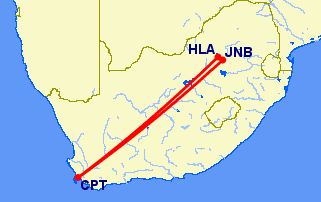 The airline flies B737-800s on both the CT-JNB as well as the CT-HLA routes. Kulula pioneered the CT to Lanseria flights, and had an exclusivity agreement with the airport for a while, much to the chagrin of the erstwhile 1time Airline in particular. Ironically, once the exclusivity ended and 1time flew to Lanseria, they soon ditched the route. Mango Airlines started flying Cape Town to Lanseria, and ever since have been engaged in a price war with Kulula on the route, to the extent that airfares from CT to Lanseria are most of the time cheaper than CPT to OR Tambo. Kulula flights from Cape Town to Johannesburg International Airport (later to be renamed OR Tambo International Airport) were the 2nd to be flown by the airline in August 2001 (after the first flight was flown in the opposite direction, from JNB to CPT). Almost 5 years later, in February 2006, the airline commenced flying from Cape Town to Lanseria Airport. There are Mango flights from Cape Town to Johannesburg (both to Lanseria and OR Tambo) - Mango's the only other low cost carrier flying the route, but there are also British Airways Comair and South African Airways flights on the route. A bunch of airlines have threatened to start up operations, but as at the date this was written, hadn't done so yet - FlySafair, fastjet, 1time and Skywise Airlines.